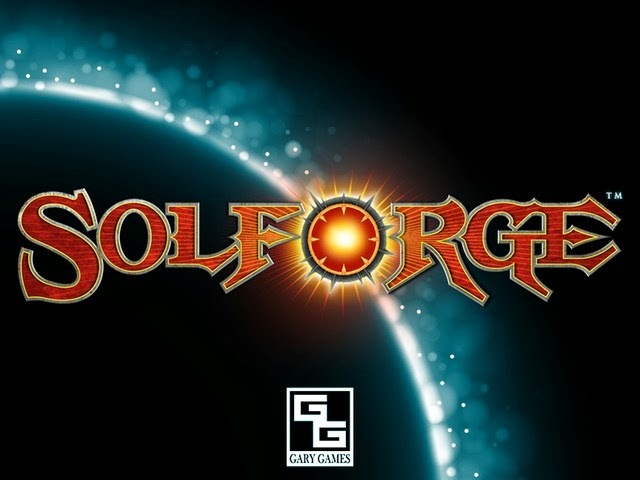 SolForge takes advantage of its digital platform as any digital card or board game should, by including mechanics that simply would not be feasible in an analog game. Much like Magic, Solforge's gameplay consists of two players with preconstructed decks racing to reduce their opponent's life total to zero. Again like Magic, players in SolForge play creatures from their hands onto the field and have them attack their opponents. Unlike Magic, however, is SolForge's big design hook: each card has 3 levels. When you play a card, the next level of that card gets put into your discard pile, and eventually you will be able to play it. This is a clever mechanic that all of the design is built around. 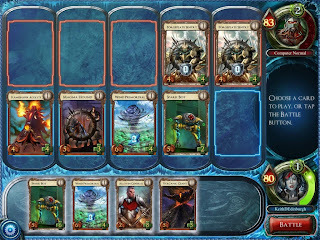 The other big mechanical differences between the two games are that in Solforge, players draw 5 cards and choose 2 of them to play every turn, then discard their hand and do it again for the next turn, and that there are 5 "lanes" to play creatures in which will be fighting creatures in the opposing lane. I like the game, I just gotta say the lanes are very Yu-Gi-Oh for my tastes. SolForge decks can contain cards from up to 2 of the game's 4 factions: Alloyin (creature buffs, robots with armor, and leveling extra cards), Tempys (damage spells, creatures with haste), Uterra (multiple creatures, creature buffs, lifegain), and Nekrium (creature removal, creature debuffs, creatures that do stuff on death). Each deck is 30 cards and can have a maximum of 3 copies of each card. 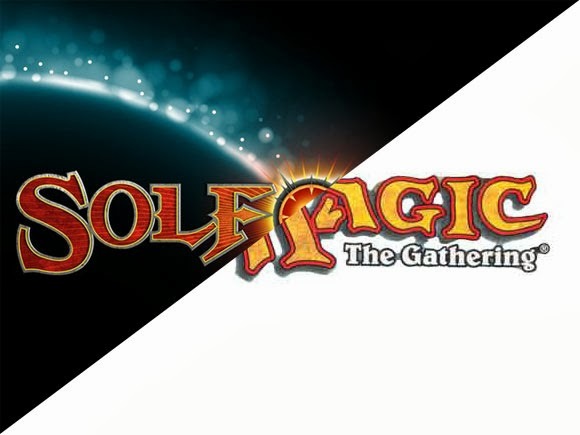 While Magic players need to worry about which colors their deck can support, SolForge players need simply choose 2 factions. This is both a blessing and a curse: on the plus side there are no lands (because there needn't be since creatures will become more deadly over time due to the base mechanic of the game), but on the minus side the two faction limit feels arbitrary and there's little reason to ever play a monofaction deck. Building decks in both games is a highly strategic process. 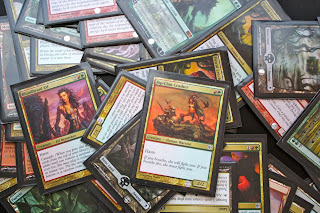 In Magic, players often build their decks to cater to the metagame (what types of decks other people are playing) to an extent, but most of the ability to customize the deck for the opponent lies in the sideboard: a number of cards that can be subbed in and out depending on what your opponent has. 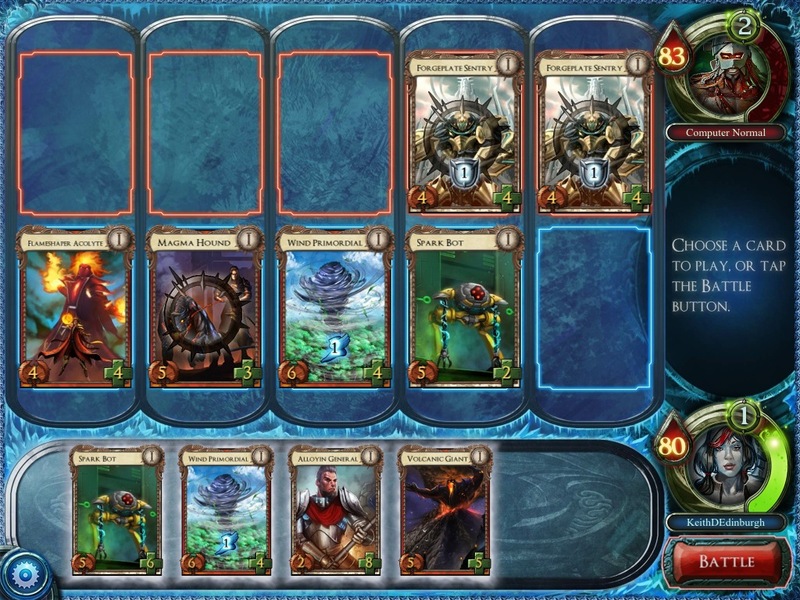 In SolForge they might eventually implement such a system, but they don't really need to. This is because of the 'draw 5 play 2 of them process.' Throughout the course of a game the player will see most of the cards in her deck, and be able to choose whether to level them (by playing them) or to choose a card more relevant to the current opponent. This means players can run hate for various types of opposing decks in their own decks, and simply not play those cards against opponents against whom it would not be effective. In Magic a card tailored to a specific type of opposing deck is a waste of space; in SolForge, such a card can simply be ignored at little cost. In the end, though, I feel as if SolForge just doesn't have enough cards yet. When thinking about interesting decks to build, too often I find myself thinking, "Card A would work really well with cards X and Y. I could totally make a deck around that if there was another card that did something similar to card A." Of course, Magic doesn't have this problem at all - it has so many cards as to be overwhelming. Fortunately, tools like Gatherer allow players to sift through cards with relative ease. Speaking of which, Solforge could use some better card set browsing functions. It's also worth mentioning that making Solforge decks takes a lot less rooting through thousands of cards. SolForge Perks: Lack of lands, flexibility of deck design. Magic Perks: Great selection of cards, ability to mix and match any colors, great card browsing tools. I think I have to give Magic victory in the deckbuilding section because its card selection is just so much more interesting. SolForge, I'm sure, will try to close the gap with upcoming sets. Where SolForge really excels is in the department of meaningful choices while actually playing an opponent. There is skill in playing Magic: you have to know the rules and how to use them in your favor, you have to know which of your opponents' stuff is a threat and when to kill it, and you have to know when to attack and when to defend. That said, I quite frequently feel that actual Magic games are really just test simulations for the decks (especially at the competitive level). The right choice is often quite determined, and the main play skill is just being able to recognize the right move. This is also why "play errors" (making an objectively wrong choice) are such a big deal in Magic - often there's little ambiguity in the right play, you're just expected to see it. Are there important choices in Magic games? Absolutely! They just frequently don't feel important, and they certainly aren't interesting. SolForge's design really shines here because your plays early game really truly matter for the way the game pans out. The same deck can be played in numerous different ways: the player must have skill and know first the base priority with which she wants to level her cards, and how that priority should shift against various types of opposing decks. If I gave my deck (which wins around 75% of its games) to another player, even one with great command of the rules of the game, I would expect that player to lose quite a bit before approaching my win rate. I would NOT expect the same to happen with Magic. Many CCGs, Magic included, load all of their strategic decision making into the deckbuilding portion of the game, which makes the actual gameplay entirely tactical and rather rote. SolForge has the strategic decisions in the deckbuilding process, but in addition the core decisions made while dueling could stand on their own as a whole game by themselves. Do I need to level removal to deal with their big creatures? Should I play aggressive and play my strong level 1 creatures that scale poorly? Should I try to be stalling my opponent into late and winning with my creatures that scale well? Of course, this reliance on knowing how to play a deck has its downside too, but a relatively minor one: if a deck doesn't work, it's unclear if it's due to the deck, or the fact that the player doesn't know how to play it. SolForge Perks: Deep interesting choices of which cards to play during gameplay, ability to change playstyles to account for opponent's deck. SolForge gets this one without a doubt in my mind. The gameplay choices would feel important on their own, even if I was playing a preconstructed deck. The same is not true for magic. Because SolForge is digital it has a big leg up on Magic in that it can played for free. New players are given a starter deck, and then can get three daily rewards: one for logging in, one for the first win, and one for the third win (which can be made against computers). These rewards give "Silver," a free currency, and either a random card or a "Basic" or "Normal" booster pack. Silver can be used to buy basic booster packs, which contain common cards, a rare, and an occasional heroic. Normal packs must be bought with real money or given as rewards, and they contain commons, rares, a heroic, and the occasional legendary. Premium packs are very rarely given as daily rewards, and I hear they contain wonderful, mystical things, but I have never received one. Unlike many other digital CCGs, free stuff in SolForge can not be achieved through grinding. You're only ever going to get three free rewards per day. It's worth mentioning that the payoff schedule of this reward system is entirely determined, and you know exactly when you're going to get a prize. This is worth mentioning because I do expect that players might eventually run into some overjustification issues where they are playing daily only for their rewards to get a specific card, and once they have that card they stop playing. Trading is not yet implemented in SolForge (which is why I keep referring to it as a CCG and not a TCG), but Stone Blade promises that it's coming. I've heard some (perhaps well-informed) speculation that all cards received from free sources will not be able to be traded. If anything kills SolForge it will be this, so I hope they have a better solution to bots farming free rewards than restricting trades. Having unrestricted trading will help bring new players to the game: you giving your new friends commons for free is an incentive for them to join, and them trading you rares they don't need is an incentive for you to recruit them! As shown by tons of freemium games (including Zynga stuff, and League of Legends, and Team Fortress 2) you can get money from players for things they could get for free if they just waited or persevered. I really hope SolForge goes the route of increasing (spending) player base by offering more for free, especially because they raised $400,000 to develop this project - they should be set on money for a while. SolForge Perks: You can play at no cost! Honestly, both Magic and SolForge are the winner when it comes to cost to play, and the players are the loser. After all, they are collectable card games, which tend to milk players for all they are worth. Magic is an amazing game; I've played it more than any other and there's so much rich complexity to it that its status as "Max's most played game" is probably never going to change. That said, in many respects I've found SolForge more fun than Magic. The game is free on Steam for PC and iOS for iOS devices, so I recommend you go get it and see if it's for you! Send me a challenge at Ramenhotep.